Nintendo Switch owners can grab a double dose of classic Mega Man today with the release of Mega Man Legacy Collection 1 and Mega Man Legacy Collection 2. 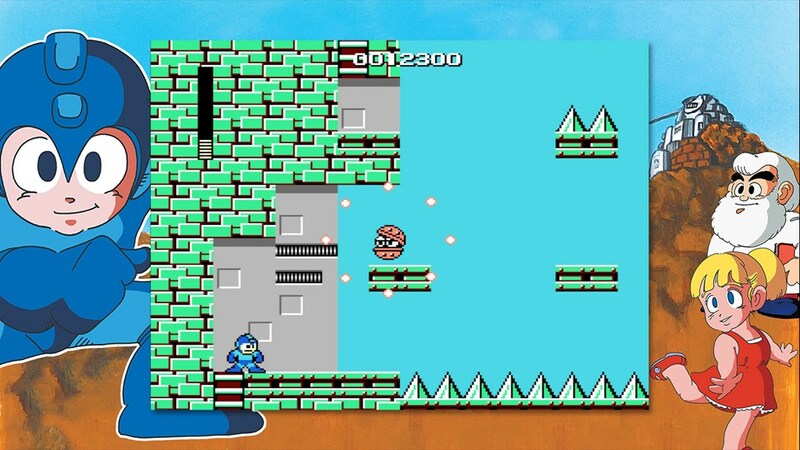 The digital eShop version of Mega Man Legacy Collection 1 costs $14.99, while Mega Man Legacy Collection 2 cost $19.99. The physical edition will run you $39.99 and includes Mega Man Legacy Collection 1 on the cartridge with a download voucher for Mega Man Legacy Collection 2. Read on for my mini review! I had the opportunity to play the Switch versions a few days in advance and let me tell you, I really don't foresee myself going back to the previous home console or 3DS releases. It is so, so good to be able to take these ten games on the go or play right on the TV. 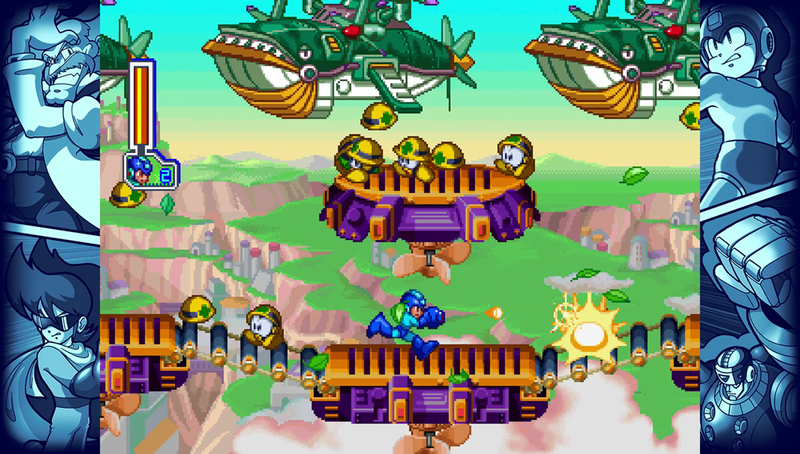 Mega Man 8 in particular looks great in handheld mode – the colors just pop! The lack of a "true" d-pad may be an issue for some, but I've grown used to playing 2D games with the d-buttons. I also have this modified baby, too. It feels so good! First, there's the new rewind feature. This function can be used at any time with the press of the L button. You can use it to turn back the clock and give yourself a do-over or manipulate the item drop RNG. It's a great way to score an E-Tank or a Life from Eddie. Second, you can now adjust the CPU speed in Mega Man 1 through 6. When toggled on, the "turbo" speed improves gameplay performance by reducing lag, screen tearing and slowdown. You can turn it off anytime you want. Third, you can unlock the 11 3DS-exclusive challenges by scanning a Mega Man amiibo (gold or blue). And just like the 3DS version you have to re-scan the amiibo every time you close the game. I was a little surprised they didn't rectify this. And finally, Digital Eclipse went back and added 216 images to MMLC1's museum mode. These images were missing from the PS4, XONE and PC versions but were featured in the 3DS version. The added images include instruction manual scans, various European box art, cartridge labels, vintage promotional sheets and assets, and lots more. All in all, the Switch version of MMLC1 is the most complete edition of the collection yet. MMLC2 is great as well, though it still feels like an incomplete package. It could've really used Mega Man & Bass! Ah well. Enjoy it for what it is, guys. Do you know if they added the "licensed by Nintendo" text and hidden Gameboy from Mega Man 7 back? I have a Nintendo Switch but I will pass. I will pick up Japanese version of PS4 since they are coming with two discs. I dont like digital one and physical one. Ridiculous. Nah. No thanks. PS4 for me this time. They added overclocking? I'll be a Maverick's uncle, err, I guess Robot Master in this case. Great for Switch players! No lie, I'd very much consider buying it if they ever patch that onto all the other platforms. Assuming it still has no 1:1 PAR output option, last I checked it was still stretched for some reason but it could also be a PC only issue, who knows, but I'm still really bummed by that, but overclocking is a huge step forward and I have to commend that. The NES games aren't especially laggy, but it's nice to be able to have that extra smoothness, if you want it. I wonder how this affects the Challenge Mode, though? Is anyone else having trouble with their MM Legacy 2 download code that comes with the physical box? It keeps saying content is not available and I have entered it in correctly several times. What about the Sega Saturn version of Mega Man 8? I'm having the same problem as Anon above and I'm really annoyed and freaked out by it. I agreed with NES Boy.. Contact Capcom of JAPAN/USA/UK and complaint. And no digital at all. I am getting PS4 instead! Prolly not, but one can dream. I'm also having issues with the DLC code. This is exactly why they should have put Collection 2 on a damn game card! I'm trying to play using the Switch Pro controller and I'm noticing the button inputs are quite delayed. I hope a whole new bunch of people enjoy those Amiibo Challenges. Especially "Wily's Machines!"